After I wrote last week's post about the ways I celebrate classroom birthdays, I thought it would be fun to put together a collection of birthday books. To be honest, I've never really given birthday books much thought. But it occurred to me that it might be nice to have a small collection at school. I was thinking the birthday child could choose one to take home for the evening to have his or her parents read to them. 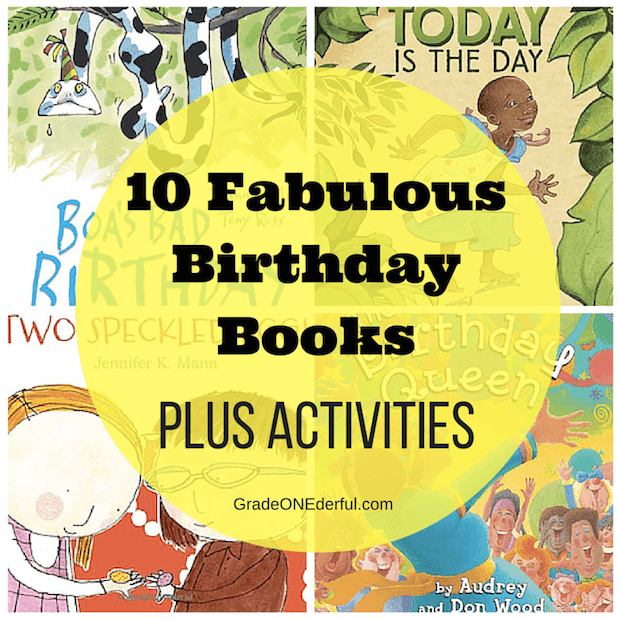 In any event, here's my list of fabulous and highly recommended birthday books! with a suggested activity to go with each. 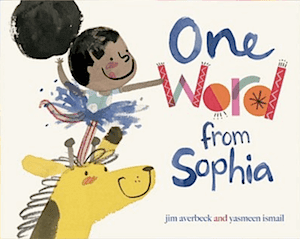 One Word from Sophia by Jim Averbeck and Yasmeen Ismail: This is a really fun and modern take on a little girl trying to convince her family she needs a giraffe for her birthday. She presents her arguments with pie charts, graphs, and formal presentations, but in the end all that's required is one simple word. Bonus: The family is mixed race AND her mother is a judge. I love that. Activity: Have your children brainstorm an item they'd really like and then create a persuasive argument using one of Sophia's methods. 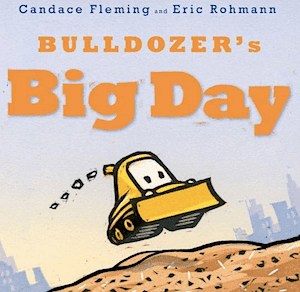 Bulldozer's Big Day by Candace Fleming and Eric Rohmann: This is a sweet book about a bulldozer's birthday. The only problem is, all his friends seem to have forgotten his big day. I think this book would be perfect for pre-school or kindergarten kids. Activity: The author uses some repetition on each page, e.g., "Today is a filling day. Filling ... filling ... filling." The kids in your class could use this technique to write their own simple story. For example, "Once there was a dinosaur. Stomp ... stomp ... stomp. He was lonely and wanted a friend. Looking ... looking ... looking." Monster Party! 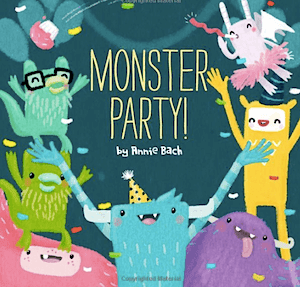 by Annie Bach: I think any child from 3 to 8 will enjoy this book. The monsters have just the sweetest little faces and the text has a lovely rhythmic rhyme. It's a circular text beginning with birthday preparations and ending with another invite. The middle? Well, it's pretty much your typical birthday party mayhem with a few tears thrown in. I liked it! Activity: You could do a rhyme roundup or have some fun creating your own monsters. I have some monster art ideas on this page and even more over here. 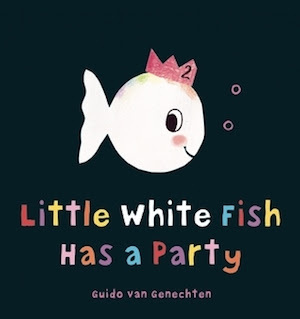 Little White Fish Has a Party by Guido van Genechten: This book would make a great read aloud for a pre-schooler and is the perfect independent reading text for a Kindergarten or Grade 1 student, depending on their reading ability. It's a question/answer book that more or less follows the same pattern. The pics are bright and cheerful and just make you smile. Activity: After reading this book your children will probably be inspired (with a little help from you) to write their own Q and A book called "Who Will Come to My Party?" 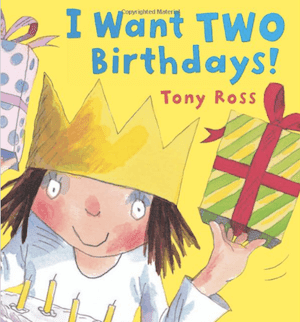 I Want TWO Birthdays by Tony Ross: This is about a little princess who isn't happy with just one birthday a year. She wants more and more and more! Her family obliges but by the end of the book she comes to realize that a birthday isn't special when it happens all the time ... it's much better to have just one. Activity: I think this book would lend itself well to a Grand Conversation about whether one birthday or many birthdays is best. It would be interesting to hear their different ideas, plus the Grand Conversation format is a great way to teach children how to value the opinions of others. Activity: It might be fun to draw a dog with a birthday hat. This link to Deep Space Sparkle shows you how to create a pup with chalk pastels. Just substitute the glasses for a party hat. 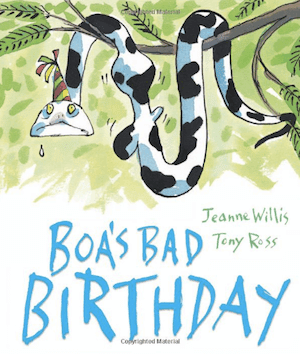 Boa's Bad Birthday by Jeanne Willis and Tony Ross: Boa was really hoping for the best birthday ever but after receiving one useless gift after another (think mittens, piano, hairbrush) he gave up all hope, until the last and most surprising gift of all. Moral: "If you ever get a present that stinks, say thank you. Because it might turn out to be the best present ever!" 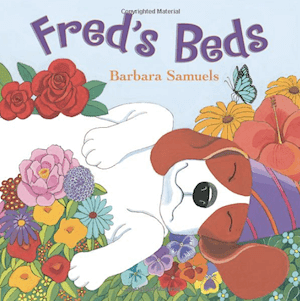 Loved this book! Activity: Before reading this book, I think it would be lots of fun to brainstorm all the "bad" gifts you could give a snake and the reasons why. I'm pretty sure the kids would find this hilarious. 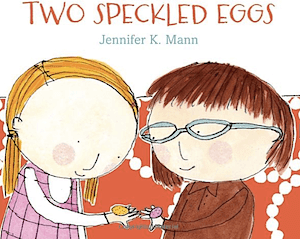 Two Speckled Eggs by Jennifer K. Mann: This story is completely different from the other books and is utterly charming. It just might be my favourite of the bunch. Ginger has to invite all the girls in her class to her party. She's not too thrilled about that because she thinks Lyla Browning is weird. But it turns out that being different can be very very good! I hope you check this one out! Activity: I think this book also lends itself well to a Grand Conversation. It would be worthwhile discussing the importance of looking beyond appearances and taking the time to really get to know someone. I'm going to read this one to my class at the beginning of the year for sure! 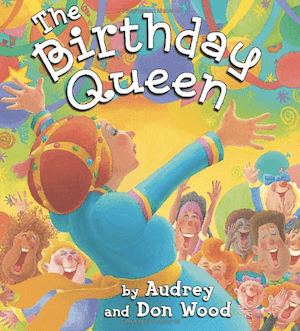 The Birthday Queen by Audrey and Don Wood: This is a real gem! But no surprise there considering who authored and illustrated the book. The Birthday Queen is portrayed as a sort of tooth fairy or perhaps Santa Claus ... magical, energetic and happy, someone who gets the job done. Can you guess who she really is? Activity: This book is a lovely reminder about the person (or people) in your life who make your birthday extra special. After reading it to your class it would be fun to write thank you cards to those people. 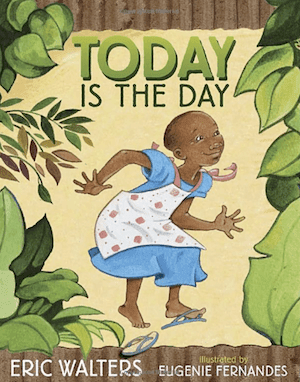 Today is the Day by Eric Walters and Eugenie Fernandes: This is a true story about how the children in an orphanage in Kenya, run by The Creation of Hope, celebrate shared birthdays on July 12. Many of the orphans don't know the date or even the year of their birth. Besides giving the children a special day to celebrate, the staff also provide them with government issued birth certificates. This means the children are now acknowledged as real people with real rights. This was a cheerful and sweet story and I highly recommend it! Activity: A natural would be to have a birthday cupcake sale and send the proceeds to the Kenyan orphanage. This book would also be an excellent start to a discussion about children's rights. I hope you enjoyed this round-up of books and that you found a couple you like. These are all new to me, I added a few to my Amazon wish list! :) I like the idea of letting the kiddos take a book home to share with their families. Thank you for sharing. They were all new to me too. I have one book in my birthday pile - Moira's Birthday by Robert Munsch. I only have one right now, too! I think it's Froggy's Birthday. I'm going to buy Today is the Day and Two Speckled Eggs, though. I really like those two. Thanks for stopping by, Sandi! I don't think I have a single birthday book in my collection. I never even thought of it! Yeah, that was a good one:). Thanks for popping in, Eric!